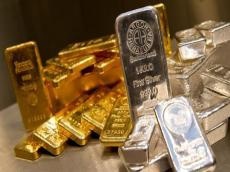 Gold and silver prices decreased in Azerbaijan, Trend reports referring to the country’s Central Bank Jan. 24. The price of gold decreased by 3.0515 manats to 2,178.822 manats per ounce in the country on Jan. 24 compared to the price on Jan. 23. The price of silver decreased by 0.0824 manats to 26.052 manats per ounce. The price of platinum increased by 9.741 manats to 1,353.625 manats. The price of palladium increased by 9.758 manats to 2,293.9375 manats in the country. The precious metals are gold, silver, platinum and metals of platinum group (palladium, iridium, ruthenium, rhodium, osmium) brought to the highest fineness (999.9). The precious metals are sold as ingots, coins or powder and have the appropriate quality certificates.